We Drink Your Milkshake! 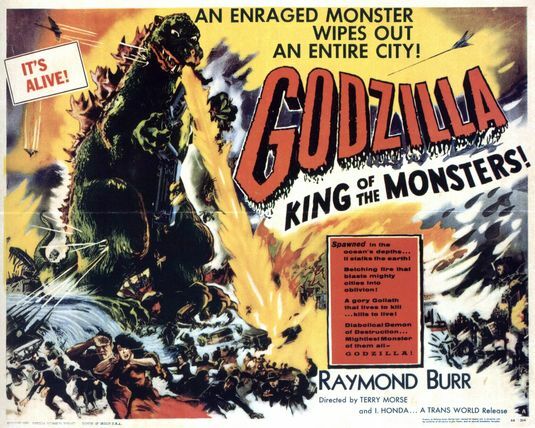 : #Godzilla2013 Entry #2 - Comparing GOJIRA and GODZILLA, KING OF MONSTERS! The obvious difference is that in GODZILLA, we have a main character in the form of a reporter stuck in the wrong place at the wrong time and having to witness all of the destruction that Godzilla causes in Tokyo. I'm not sure if maybe I just noticed it more here, but there seems to be an overabundance of use of voice overs and expositions in GODZILLA. Steve Martin ends up talking during a lot of the scenes where there's more of the Japanese culture being highlighted and during the attacks. While this is a legit complaint for me, I completely understand that the movie needed to be changed like this in order to make it make sense for American audiences and for editing purposes. The editing in this version of the movie is quite fascinating. The editors did a fantastic job in adding in Burr into the scenes rather seamlessly (for its time) into scenes with the majority of the Japanese actors. I would even say that the dubbing was pretty decent and not nearly as terrible as pop culture references make it out to be. A big complaint that I had about the movie was just little impact a lot of the social commentary and brutality of nuclear warfare is lost in its translation. Don't get me wrong, there were probably a lot of socio-political reasons to not include so much of the brutality of nuclear weapon as much, but it's nevertheless a little disappointing. A big example is the opening scene where the "Luckiest Dragon"-esque ship is sunk. The scene in the original is brutal and devastating whereas in this version, the scene is reduced to a mere sequence within Burr's narration. Among other issues, there's hilarious fact that a foreign member of the press would have access to such important meetings within the government and knows what they will be doing. This edit is fine. If you haven't seen the Japanese GOJIRA, you wouldn't really feel like you missed anything. If you have seen it, you will see that there's a lot more "Americanization of the story". A lot of the cultural references are definitely put to the background and that takes a lot of the impact away from the story.